Finally an answer to the age-old question: Can peacocks fly? United Airlines turned away an emotional-support animal — a proud peacock — at a New Jersey airport this weekend, as airlines have been considering with new guidelines for service and comfort animals. United Airlines said in a statement to NBC News that the peacock “did not meet guidelines for a number of reasons, including its weight and size." The incident took place in the lobby of Newark Liberty International Airport on Saturday. “We explained this to the customer on three separate occasions before they arrived at the airport,” the airline said in its statement to the peacock network. The Jet Set, a travel and lifestyle show, first reported the incident. The site included images of the flamboyant bird on Facebook Sunday in a post saying the emotional-support peacock was denied boarding. It was unclear if the passenger and peacock made it to their destination. The airline said that it was reviewing its existing policy and planned to share more soon. 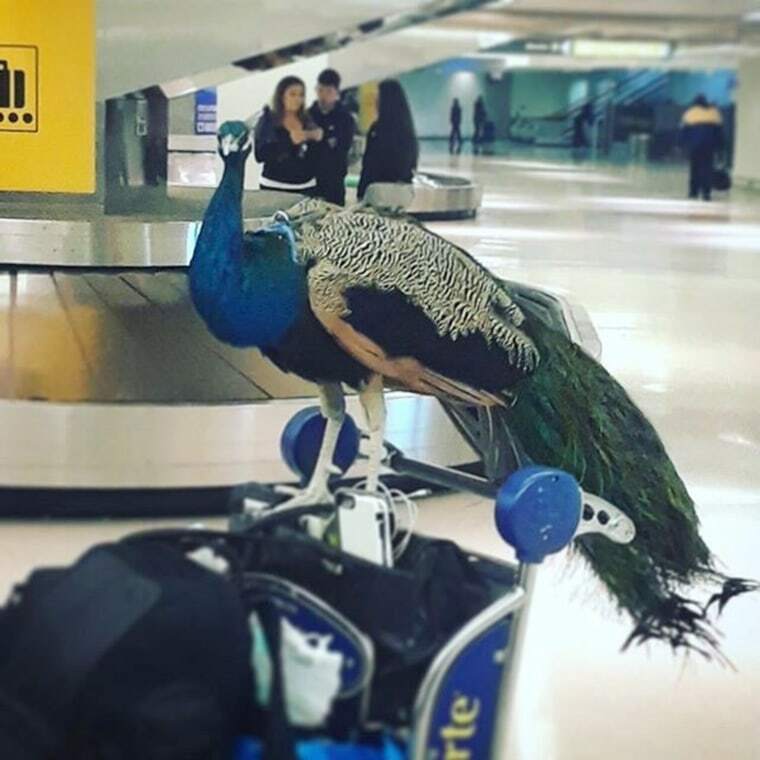 A video posted to The Jet Set’s Facebook page showed a woman wheeling luggage with the peacock perched on her shoulder at the airport. “I’m not kidding this woman is wrangling her peacock into the airport — right now, wrangling a peacock in the airport,” a woman can be heard saying in the background of the video. “That just happened, what the hell New York,” the woman adds (although Newark airport is technically in New Jersey). The Department of Transportation's guidelines for air travel with service animals states "unusual animals are evaluated on a case by case basis" and that airlines may exclude animals that are too large or heavy to accommodate in the flight cabin, pose a direct threat to the health or safety of others, could cause a significant disruption of service or are prohibited from entering a foreign country. Airlines are also never required to accept snakes, reptiles, rodents, ferrets, or spiders. The United Airlines incident comes after Delta released a statement on Jan. 19 announcing new requirements when it comes to emotional support animals. Related: Pets on the fly? Why are there so many animals in the skies and at airports? Beginning March 1, the airline will require passengers with service animals to submit paperwork two full days before flying. The owners of emotional support animals will also need to offer a document, signed by a doctor or licensed mental health professional, verifying that the creature will behave.